LaCie have a snazzy multimedia 1 TB GB HDD out there at the moment. Simply connect the LaCinema Premier to your PC or Mac via USB to transfer your digital media files; then plug it into your TV for instant playback. 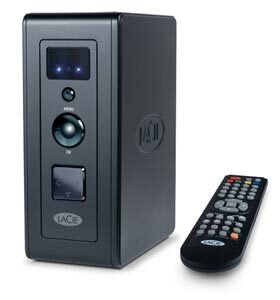 The unit will play nicely with Windows 2000 upwards, Mac OS X and Linux systems that have support for USB hard drives. Prices range from US$300 for the 500 GB version up to US$650 for the 1 TB model. For some reason, I’d rather stick a 1 TB HDD in an old PC and use that with decent video and audio cards but that’s just me I guess.